A protest was conducted against killings protester in waliveriya who asked to close down the hand glows factory. 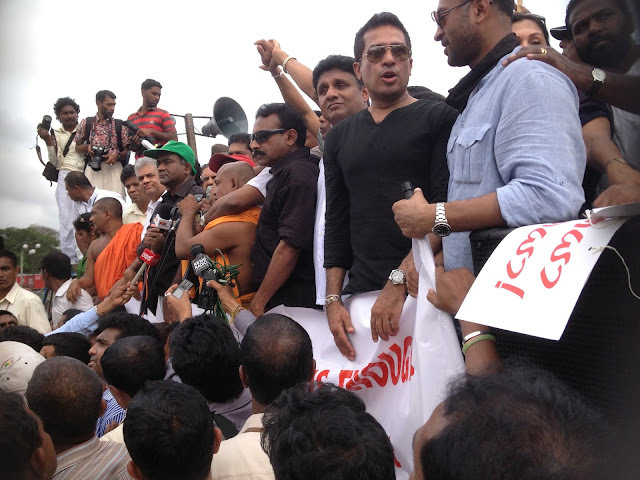 Protest was organized by the Force of unity. 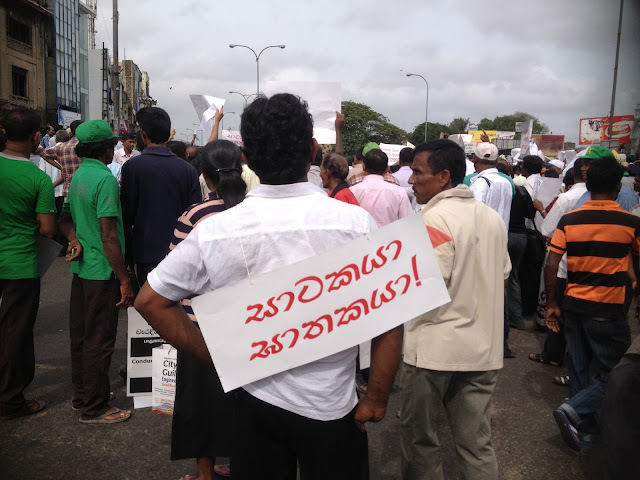 about 1500 to 2000 people were participated to the protest. By Lakna Paranamanna and Sarasi Paranamanna. 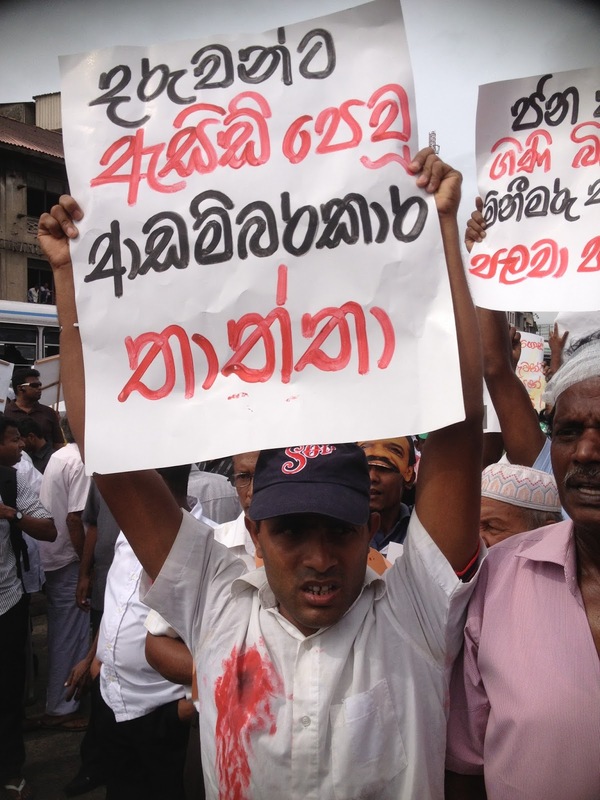 The little town of Weliweriya and the villagers who had been pleading with t he authorities for an effective solution to their grievance of clean drinking water received media attention on Thursday when they staged a demonstration blocking the Colombo- Kandy road at the Weliweriya town. The demonstration in Weliweriya took an unexpected turn when the military was brought in to disperse the protesting crowds. 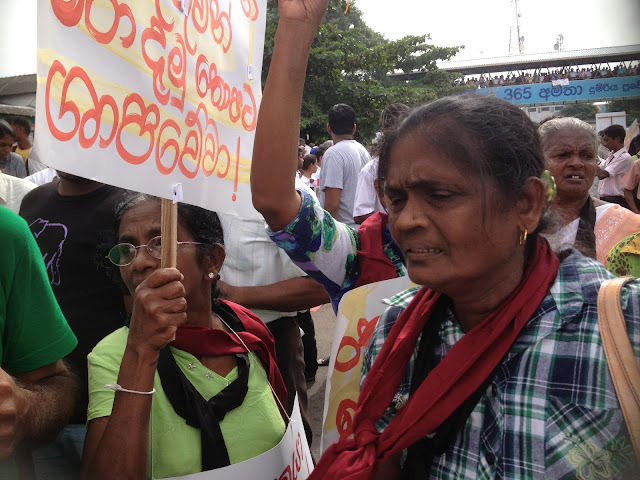 T. Liyanage, a resident of Weliweriya who witnessed the entire skirmish that unravelled since the arrival of the military claims the entire town turned into a battle ground within a matter of a few seconds. “Once the military arrived, the Brigadier and the Lieutenant Colonel in charge of the troops met with the protesting monks and asked them to disperse. 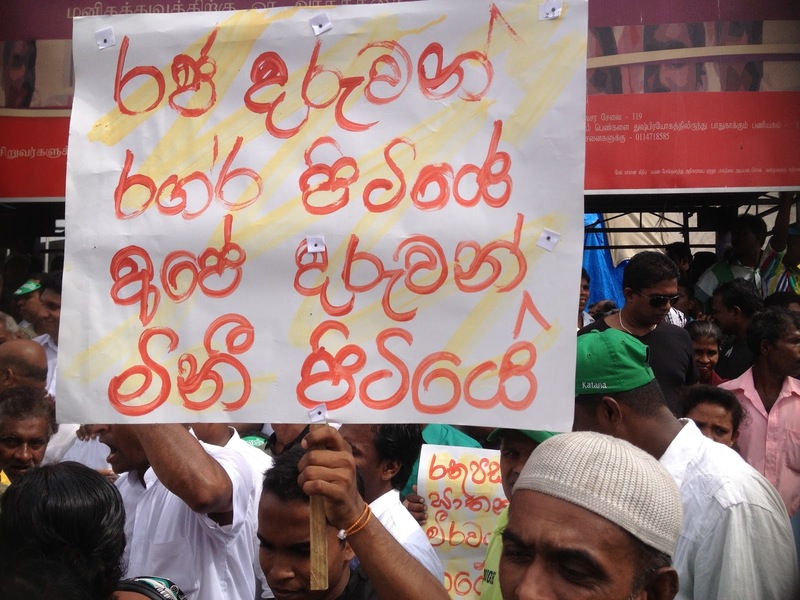 The monks informed them that they alone couldn’t make a decision and inquired from the protesting villagers whether they were willing to move; but they refused. Then the agreement was to discuss with several representatives of the group and arrive at a solution but before any decision was made, the military started advancing towards the protestors and pushing them away, yelling at the crowds in filth,” he said. 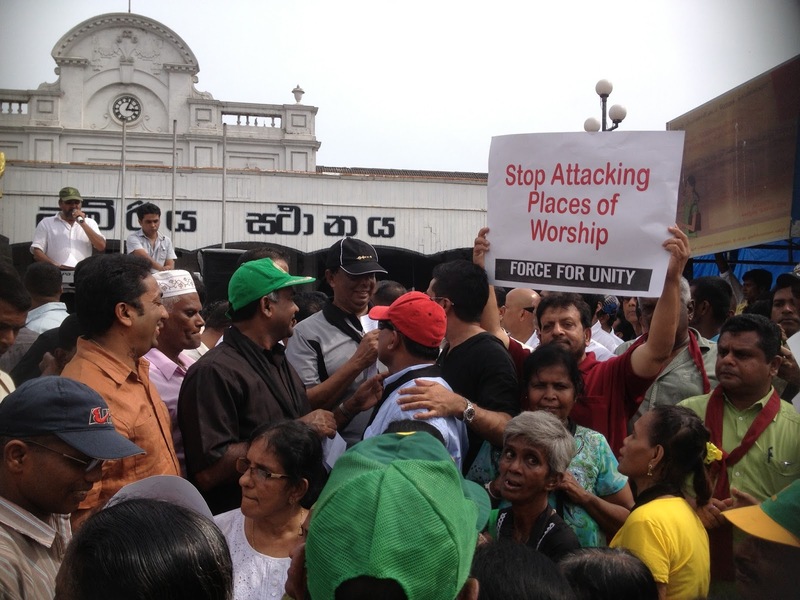 Church turns into a battleground? The remnants of the reasons that caused those at the St. Anthony’s church grounds to wail could be seen yesterday mor ning. Although villagers claim that the pool of blood on the side of the church corridor was washed away by army personnel last morning, several blood-stained boot prints remained on the polished cement floor. Even within the church, dried blood stains could be seen amidst pools of water. The outer and inner walls as well as the stained glass windows of the church appeared as if they were part of a war-torn site – the morning sunlight streaming through the bullet holes in the stained glass and the church walls, damaged. Several leftover bullet shell casings were seen on the church grounds. Several villagers on the site and the UNP MP John Amaratunga who visited Weliwariya together with Opposition Leader Ranil Wickramasinghe and Gampaha district MP Ruwan Wijewardena yesterday morning said the church priest was allegedly forced to kneel at gun-point and was assaulted by the military personnel who stormed into the church, demanding for those who fled into the church seeking safety, to be thrown out. They claimed that in the process, a young girl who had been inside the church was severely assaulted as well. “They even stormed into the nunnery and had held a gun at the nun and threatened her,” one of the villagers said. The aggrieved villagers gathered at the church grounds yesterday morning and voiced their objection over the handling of protestors by the military. “I was at the protest when the clash occurred. People were talking about moving away from the road but before they could even decide the Army started firing. They fired shots everywhere and people panicked and most ran towards the church because they thought the Army wouldn’t come inside,” said W. Rukmani who had been among the protestors. She expressed her repugnance at the manner in which the army allegedly assaulted even women after storming into the church. “They even hit women – it was terrible. The Army switched off the lights and began assaulting the demonstrators. When the clash subsided we came out to go home but my husband’s motorbike that was parked near the church was damaged,” she said. 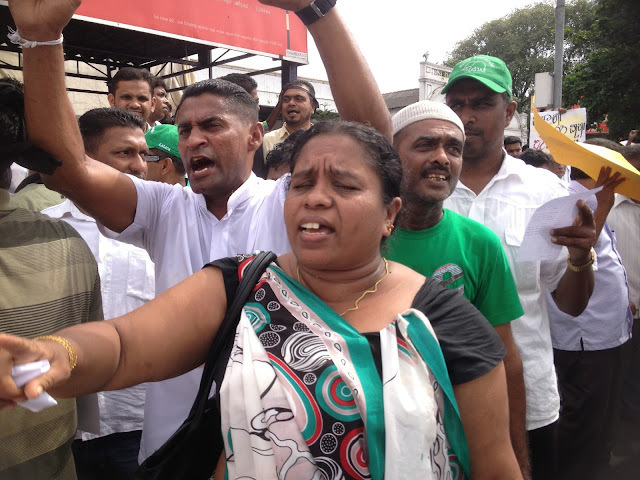 Another protestor who was mourning yesterday at the church grounds – Chandrika, was very emotional about the untimely death that came upon the young schoolboy. She broke into tears outside the church while she recited the ordeal faced by the Weliweriya residents. “We did not demand part of the country; we were only asking for clean water and for six days we protested peacefully. We staged the demonstration only because we didn’t get any response from the responsible authorities. We asked for clean water and our pleas were responded with bullets and bloodshed,” she cried. “They didn’t stop at assaulting the people but even violated the sacredness of this holy ground. We were unfortunate enough to witness this disgusting act. I might be arrested tomorrow but I’m not afraid to tell the truth because we would die anyway – either by the bullets fired by t he Army or by drinking the contaminated water,” she cried and strongly asserted that they no longer wanted any elections in the Weliweriya electorate. A resident of Galloluwa – a village located close to Weliweriya who wished to remain anonymous said there were many people and school children who were passing through the town that evening when they got caught in the midst of the clash. “I was returning home from work when I too got caught in the chaos. While I was fleeing towards safety from the shots that were being fired at the crowds I saw a lady, carrying an infant trip and fall. Before anyone could come to her rescue, she was assaulted. It was disgusting to watch it,” he said. 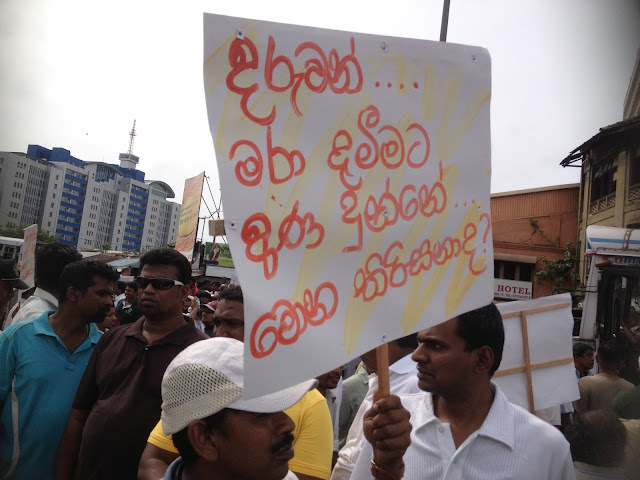 Dinesh Sanjeewa, a resident of Helenwatte confirmed the allegations that among those who were attacked and arrested were people who had not participated in the protest. 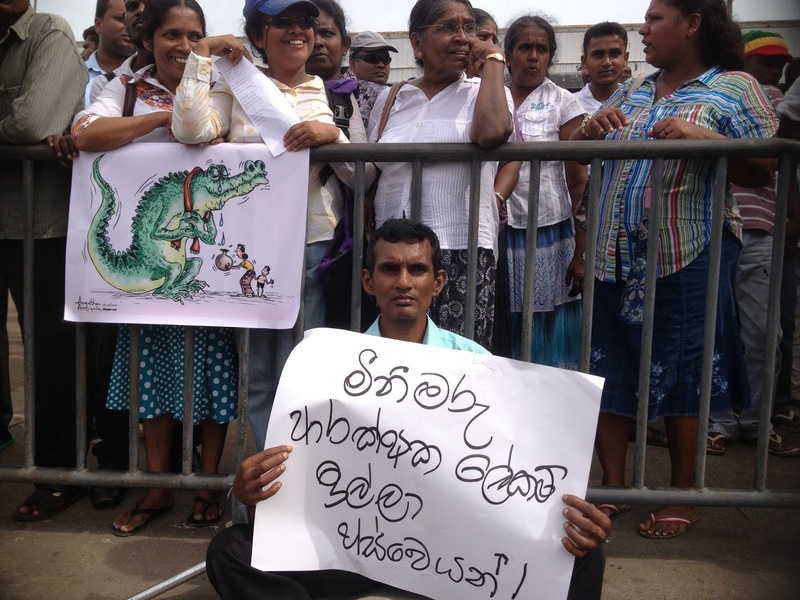 “When the army started assaulting the villagers they did not pick and choose. It was a brutal attack launched on every single person they came across. But before the attacks began, they knocked off all the lights and crushed CCTV cameras that were fixed in various shops. The terror they inflicted was not limited to the town – they even chased people down by roads,” he says. 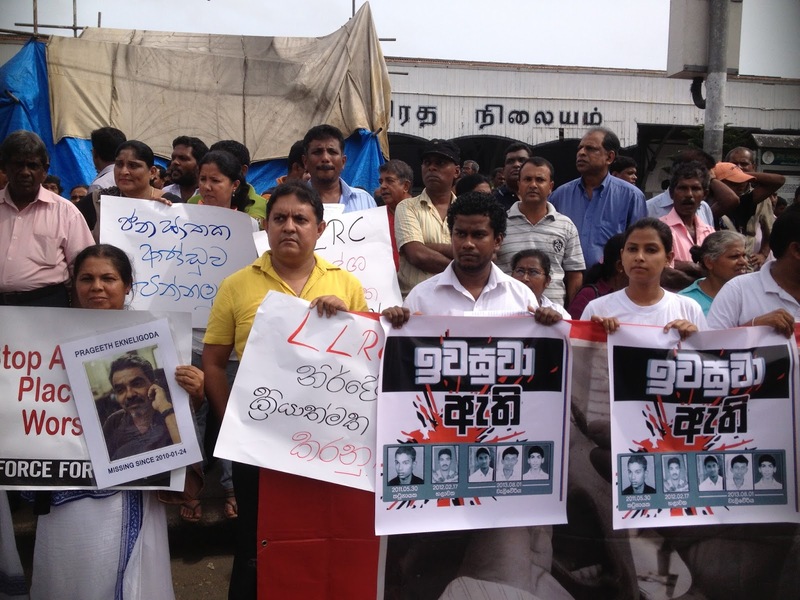 The horrific incidents that occurred after the villagers’ protest will haunt our memories. It seems that it is only after innocent lives are lost to violence that those in power open their eyes and ears to grievances of the public – in this case, the basic human right of access to clean drinki n g water. Government sources distressed at the turn of events suspect radical elements sponsored by an unseen foreign hand, wishing to bring this government to disrepute before the CHOGM, as well as set the stage for international pressure when the CHOGM commences. Colombo Crime Division (CCD) has taken over the investigations into the incident in Weliweriya. A senior police officer said already statements were recorded from more than 50 persons, including the injured persons and journalists. "How can anyone say for sure that he died due to a shot fired by the Army? Those who retaliated violently towards the Army were firing too." Commenting on the 17 year-old school boy’s death he said that it was best to allow the ongoing Police inquiry to be concluded concerning the clash. “How can anyone say for sure that he died due to a shot fired by the Army? Those who retaliated violently towards the Army were firing too. But if we receive credible evidence concerning incidents where the officials have acted beyond their mandate, we will definitely hold disciplinary inquiries and take appropriate action against them if the allegations re proven,” he added. Chief monk of the Galloluwa Sri Sambuddhatva Jayanthi Viharaya, Venerable Theripaha Siridhamma speaking to the media yesterday said that he carried out fasts unto death campaigns twice hoping to gain the attention of the relevant authorities so that the operations of the factory allegedly responsible for the water contamination could be closed. But he says he did not receive any response to the pleas. 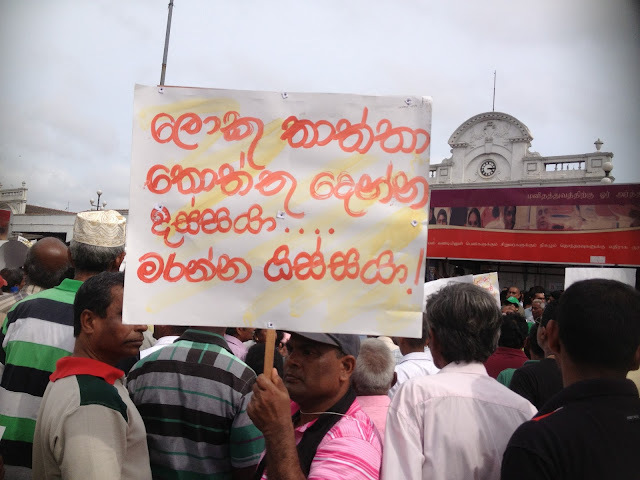 “Our grandchild’s murderer is roaming in the streets of the Weliweriya town even as we speak. Our Akila did not do anything wrong to deserve such a cruel fate. 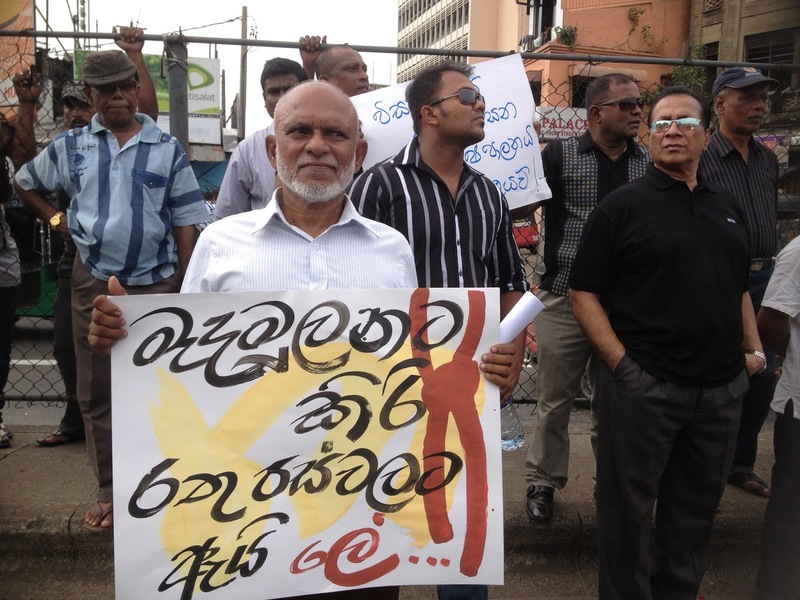 He was just a child,” said Sunil and Manel Jayawardena, the grandparents of Akila Dinesh, the 17 year-old schoolboy who died succumbing to gun-shot injuries he suffered while caught in the violent clash that erupted in Weliweriya. Sunil and Manel were seated in the verandah of their home, grief-stricken and waiting for their grandchild’s body to be brought home. Akila was the only child in his family. “He was not part of the protest, he was returning home after his tuition class,” Manel said as she wept, tears rolling down her cheeks. The news of Akila’s death had reached the family only yesterday morning. “We couldn’t go looking for him on Thursday night because we couldn’t step out of our houses. The clashes went on till late in the night and the Army was combing the area looking for protestors so no one dared step out,” said Manel. “We had such high hopes for him . . . He was quite good in sports and was even in the school football team. He did not have to die like this,” said the grief stricken grandfather, Sunil. Akila was a student of the Yakkala Sri Chandrajothi Vidyalaya. The Government yesterday expressed its condolences to the family of the youth who was killed during the Weliweriya protest on Thursday afternoon. 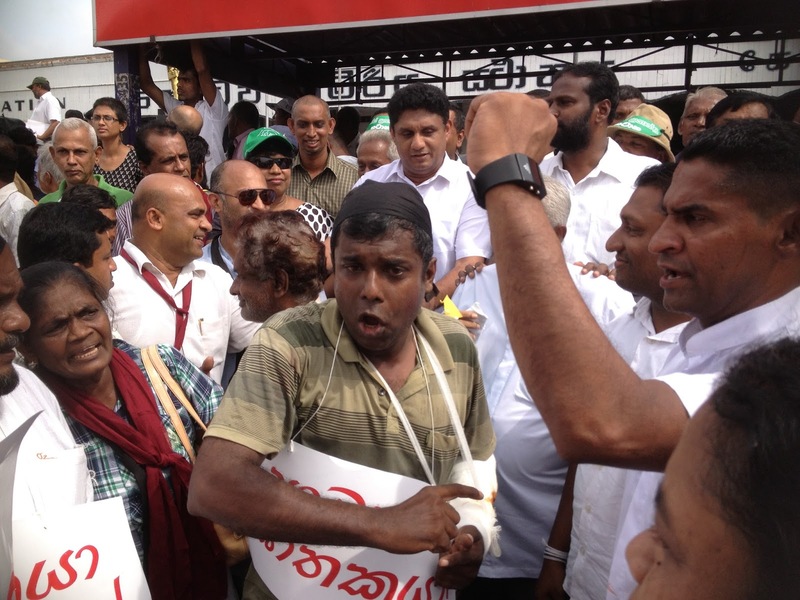 Government Spokesman and Minister Keheliya Rambukkwella said the Army did not have a choice because they too came under attack after the police found it impossible to control the angry crowd.